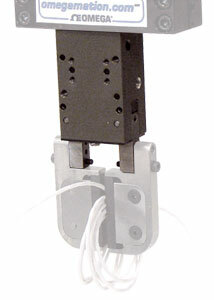 DCT-RE Series Pneumatic Grippers are angular grippers with a spring assist. This Fail Safe spring allows the gripper to retain the component should the air pressure supply fail, it also allows the gripper to be used with a single acting mode. DCT-RE pneumatic grippers have a 180° jaw opening allowing complete release of a directly fed part. Gripper forces ranges from 40 N (9 lbs) to 141 N (32 lbs). These angular grippers are compact and designed for confined spaces, but consideration must be given to allow for the additional space required for the rotating jaws. The adjustable stop accessory (BR) will help to reduce the space requirement by restricting the open position. Standard mounting is from the top, but the gripper can also be mounted from the back of the body and will operate in any direction. Each jaw has a useful rotational stroke of 90° for a full 180° opening and there is a over-stroke of approximately 1.5° before reaching the fully gripped position. Jaws have to be designed to close for a grip of 0° gripping position (parallel jaws). Pnuematoc linear motion automation components are double acting air cylinders that require a dry air supply with filtering to 40 microns or better. For best control of pneumatic components, flow control valves (regulating out) should be installed to regulate the speed of the device. Position sensors can easily be added to motion components to detect the end of travel positions of the slides, they are the standard method of communication with the PLC and are available in inductive or magneto resistive sensing styles and come in both PNP or NPN sourcing signals. 참고: Sensor and cable sold separately. Inductive sensor not available on DCT-12M-RE.